I almost want to begin and end this story with the sentence above. As the interviewer, it speaks volumes, but it would be unfair to the reader to end with this sentence. At least I would be annoyed as a reader. Sometimes we meet people who are more than a passerby in our journey. They are spiritual beings made of earth, grounded in their descendant nature, using words to transform ways of thinking. Sometimes we bask in the presence of spirit-beings who are beyond their own spatial time. They show us that all things are accessible if we are willing to tap into that inner-treasure that sits at the pit of our stomachs. I met a few particular women this 2015 summer in the Art of Text workshop at Kenyon College. Mireidys is one of the women who inspired me. Her family is from Pinar Del Rio, Paso Real, Cuba – a rural place where much of the crops that feed the majority of this country’s population are grown. She was born in Cuba and moved to Hialeah, Florida when she was 4 years old. She explained that her grandfather was a political prisoner. He was allowed to leave Cuba by himself when he finished his sentence, but he refused until he could leave with his whole family. This eventually happened, with great effort. In asking Mireidys about other places she calls home, she mentioned Amherst, Massachusetts where she went to undergraduate school and found a safe familial space. She received her B.A. in Creative Writing and Cultural Studies from Hampshire College and will be completing her M.A. in Publishing and Writing from Emerson College December 2015. I, of course, asked her about writing and what it meant to her. She said she has always been a writer and that she always felt like she spoke in poetry. In the video she speaks of this literary experience. My favorite poets are Pablo Neruda and Aracelis Girmay. Neruda is the only author whose work I’ve enjoyed equally in Spanish and English. For me, none of his magic is lost in translation. Girmay is a political poet and the most predominant mentor figure I’ve had in my journey as a writer. I admire the incredible urgency and intimate delivery with which she conjures the unspoken. My favorite book is Just Kids by Patti Smith. This is the first novel I picked up after years of only reading poetry and I was captivated by Smith’s lyricism and zealous honesty. I think what moves me most about Mireidys is the thickness in her poetic tongue. Her words sit with me and remind me that I am a part of this world in a very spiritual way. I remember watching her in the summer workshop. She moved from that pink typewriter to her space at the table and back to the typewriter. At one moment she was sitting right outside of the studio completing a writing assignment for the workshop. She was intense and deliberate in creating both her stories and books. In the midst of creating, though, she smiled. She smiled an earth-tone smile that reminded me that she is both night and day. She makes up the best of 24 hours, especially when under pressure. She worked tirelessly, which is why I chose her as a feature. Mireidys Garcia Jimenez reminds me of the greatest possibilities. Watching her made me reflect and ask, “How bad do you want to write and publish TC?” Moreover, “How hard are you willing to work for these possibilities that are knocking at your door?” Her literary talent and hard work inspired me to create more time and space for this art form I believe in. The following poem is an excerpt from Mireidys’ upcoming collection. The poem is entitled The Cuba I Stole from my Mother’s Tongue. for the waves in the vast Atlantic Ocean. trying to make constellations out of English. Traci Currie is a Communication and Visual Arts lecturer at University of Michigan-Flint, as well as a knit-crochet artist, writer, and spoken word performer. She has been a part of the art world for over 15 years as an art gallery board member; spoken word series organizer; performer, nationally and internationally; and published poet. She believes The PRC will help women reach their highest potential. “The Phoenix Rising Collective is about empowering women to take ownership of their lives, claim their identities and be the positive change they wish to see in the world they live.” You can learn more about Traci’s work in creative arts HERE. 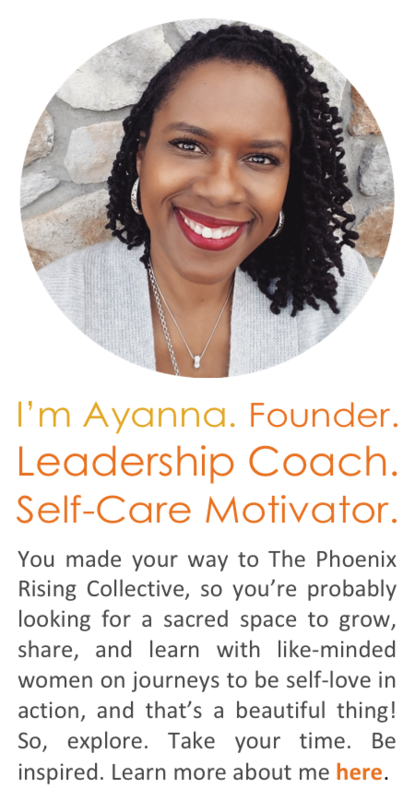 Categories: Self-Care + Personal Growth | Tags: artists, creatives, personal growth, poetry, self-acceptance, self-confidence, self-love, the phoenix rising collective, women artists, women writers | Permalink. 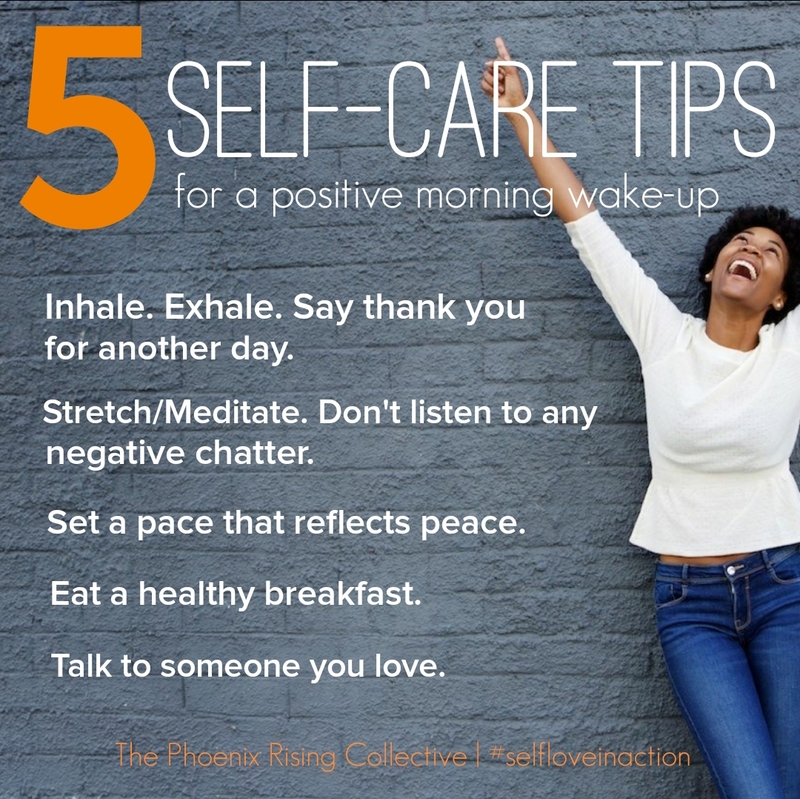 I love myself first by learning to take care of me and recognize that I need to practice giving love to myself as much as I do others. It means I have to be more in tune with myself. I pay closer attention to signs when it comes to my body, my mind, and my soul. For instance, when I can barely drive home from work in Washington, DC to my home in Maryland, due to exhaustion, that is my cue to get home, eat lightly, take a quiet, relaxing bath, and immediately go to bed and sleep as long as I can. I also release stress by taking long walks and/or going to the gym for an hour. When I am done, the stress dissipates. While walking, I thank God for all that He created and has given to me. Our brain handles a lot of information. There’s a dark side and a light side. When the dark side creeps to the front, I shut it down quickly by focusing on things that are going well. The negativity that creeps up is when that voice tells you cannot do something: “You’re not smart. You’re not qualified. You’ve messed up.” I shut it down quickly! Negativity has a tendency to consume us if we allow it. I try to keep my mind away from negativity. Even when I hear gossip, I attempt to steer the conversation to something positive. My soul is my heart. I’ve allowed it to be hurt many times because I trust until someone gives me a reason not to trust them. I’m not that way anymore. I now put my total trust in God, and I’m more protective of my heart. By being this way, I do not get hurt as easily as I used to. I have a closer relationship with God now. I give Him all my cares. I exercise to alleviate stress and keep myself fit. I read motivational books that empower me to keep moving forward to fulfill my dreams. I spend quality time with family and we have movie nights and catch up with one another. Sometimes, we take walks and just talk. I also have date-nights with my partner. Although we have busy careers, we make time to be together and enjoy each other’s company. Trusting people was my biggest flaw. As I trusted, I was disappointed over and over again. I believe I trusted others more than I did myself. It’s a big difference when you begin to trust and rely on God. My second biggest flaw was that, as my mother puts it, “People know where your buttons are.” As a result, people that I trusted knew how to hurt me because I showed my vulnerabilities. When I began to love me, I no longer allowed people to know where my buttons were to be pushed. I became stronger. Self-love is the most critical element of love. You cannot give love successfully until you learn to love yourself first. Now that I love myself, I’m more protective over me. I’m not as vulnerable or as accessible to being hurt. Self-love simply means loving who you are – and that’s what I do. 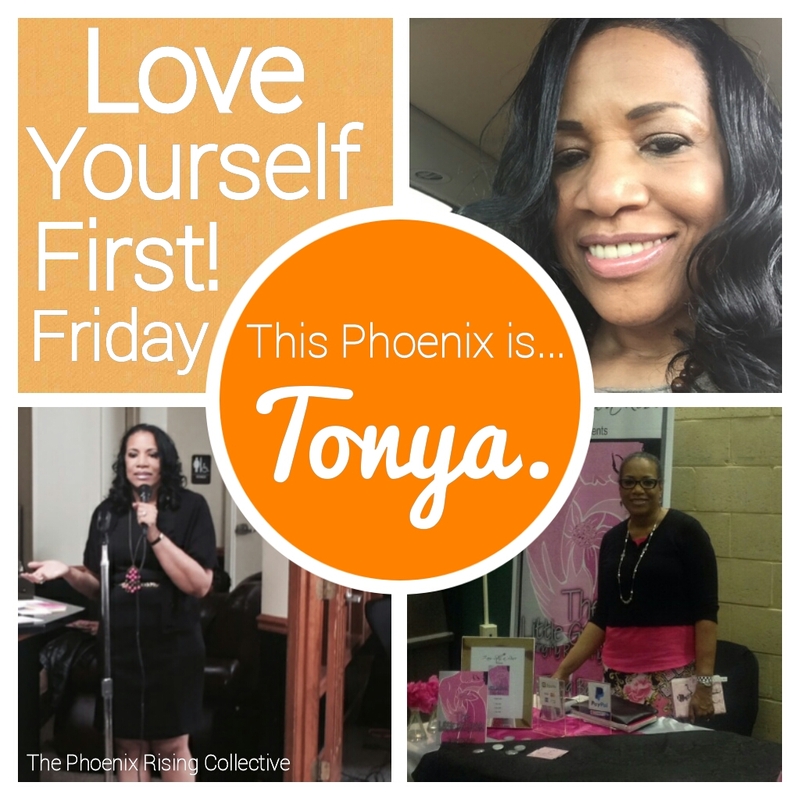 Tonya Barbee is author of The Little Girl Inside: Owning My Role in My Own Pain. She’s excited about encouraging others, particularly women, to find their way during transgressions and to never, ever, give up. She lives with her two youngest of four children in Bowie, MD. Check out her website: I am Still a Rose. Categories: Love Yourself First! 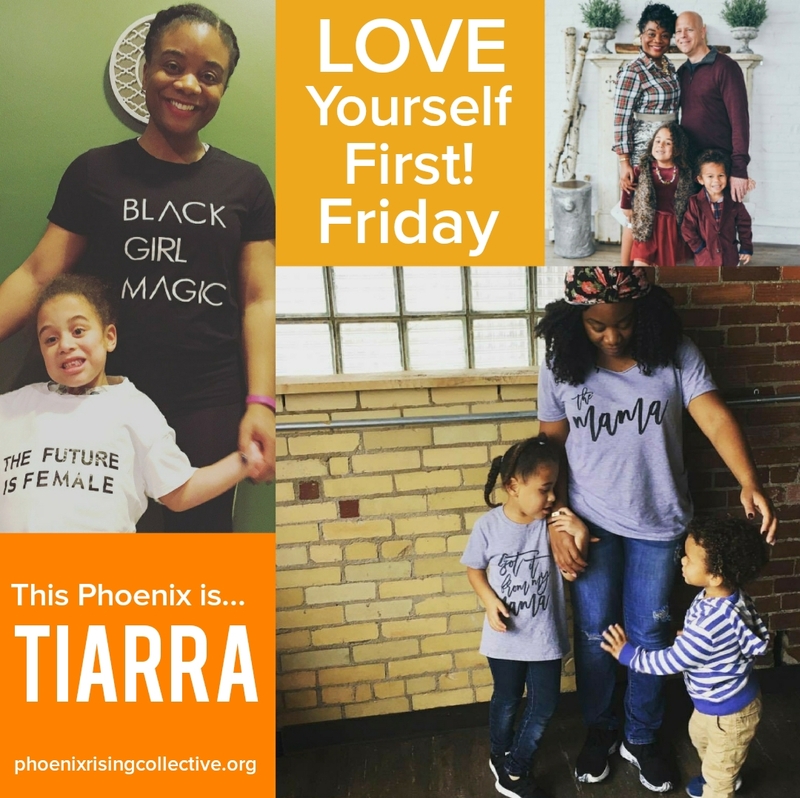 Friday | Tags: inspiration, Love Yourself First, LYFF, personal growth, self-care, self-confidence, self-love, the phoenix rising collective, wellness, whole living, women's empowerment | Permalink.